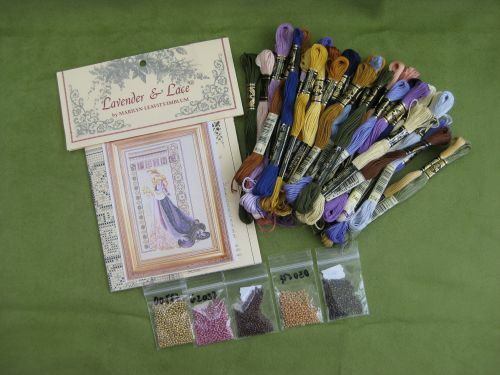 Passionate about embroidery, dollhouses and cross stitch! 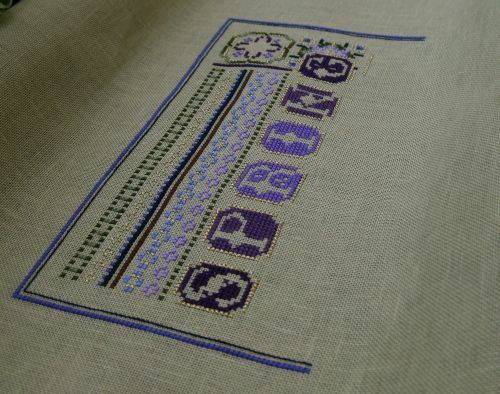 This is what I’m stitching at the moment – the Lavender and Lace ‘Celtic Spring’ cross stitch design. I thought I’d explain this week about how I tackle large cross stitch projects such as this one, as I think that being organised makes it much easier to attempt a design this big (it’s about 18 inches high by 9 inches across on 28 count fabric, just for the stitched area, and the Autumn one in the same series took me about 90 hours of stitching). With a design this big, I always use a rectangular rotating frame to mount the fabric on – it keeps the fabric taut (very important when I get to the stage of adding the beads), and it means that I can rest the frame comfortably on my Stitchmaster floor frame, so that I am in a comfortable position while I’m doing all that stitching! I’ve been getting very committed to doing at least a couple of hours on this each evening, and if I tried to do that with the fabric in a hoop, holding it with my left hand and stitching with my right, I’d have a frozen shoulder by now, and my chiropractor would be telling me off! You can see from this image that I have scanned in the chart and printed it out onto white paper (the original chart is a large piece of beige paper), and I’ve then coloured in the page with coloured pencils. To my brain, it’s easier to tell different colours apart than different black and white symbols. I have several needle minders holding down the chart paper – not because they’re necessary, really, but because I love needle minders! The ‘grime guard’ along the bottom edge is an elasticated rectangle of fabric with casings made along each long edge, with elastic threaded through in one loop, so that I can hook the ends of the elastic over the vertical bars of the frame and protect the bottom roller from any dirt while I’m working on the cross stitch. What really saves me a lot of time when I’m working on a piece of embroidery with many colours is that I use one needle per colour – so I use one of these, which is a LoRan needle holder – a plastic triangle (like a Toblerone! ), with a foam centre to poke the needles into, and a removable paper strip that has the black and white symbols for this project drawn on. You get about a dozen strips with the needle holder, and refills are available too, but if you’re careful you can rub the symbols out and re-use the strips a couple of times, as they’re made from quite sturdy card. You can just about see that towards the left hand end of the bottom row there is a yellow pearl-headed pin – I use this to mark the place of the needle that I’m using at the moment, so that I know where to replace the needle when I’m finished stitching (when shades are similar, it’s easy to get confused!). 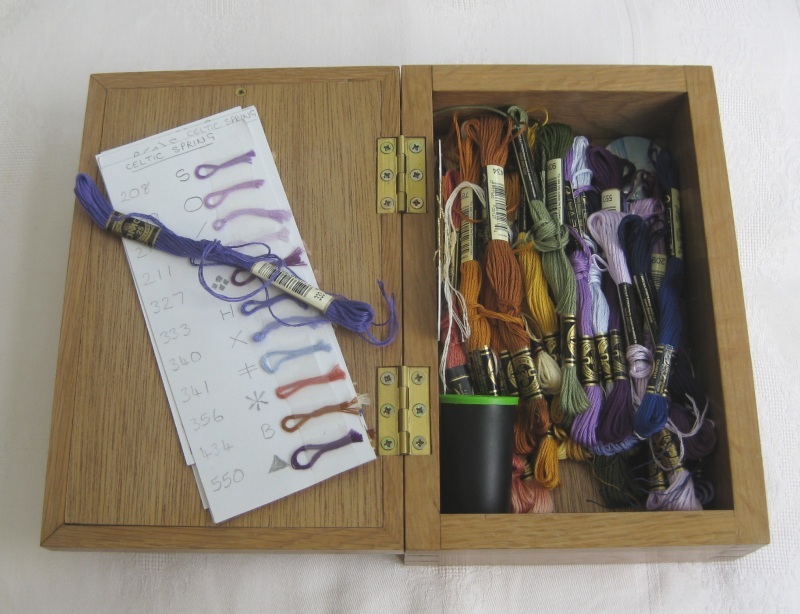 I keep all my skeins in this – my lovely embroidered workbox. 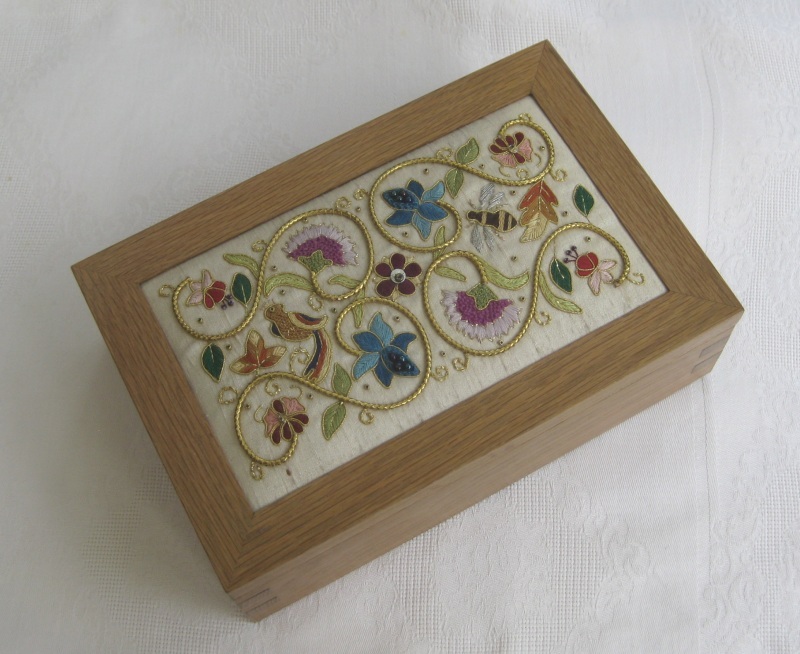 I did the stitching for this about twenty years ago, and my husband made the box. I love using this! It’s about ten inches by seven by three – big enough to keep whole skeins in, plus scissors, etc. This is it when it’s open. Very simple inside – I didn’t want lots of compartments that nothing really fitted into – just one space. If you’re REALLY OLD, you might recognise what I keep my supply of tapestry needles in – it’s a black and green plastic canister for 35mm film, for a very old camera! I’ve never found anything better than that for my needles …. When I start a large project, I also make cards listing the shade name, number, and add a tuft of the thread so that I can cross-check this with the skeins I’m choosing. 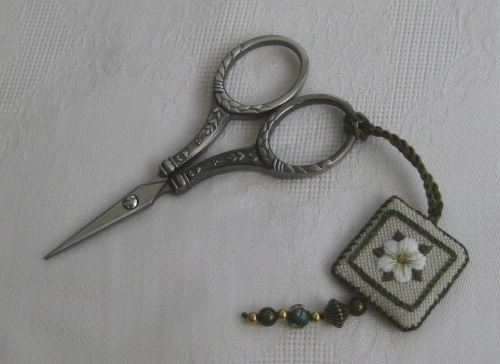 Of course, I also need some embroidery scissors! I’m kind of addicted to buying scissors, so with each new project that I start, I exchange my scissors for a different pair from my collection. I bought these ones from Mace and Nairn, about five years ago. The scissor fob is from the Carolyn Pearce ‘Home Sweet Home Workbox’ project that I described on here a couple of years ago as I made it. So, that’s all the stuff I use…how about you? What can you ‘not do without’ when you’re stitching? 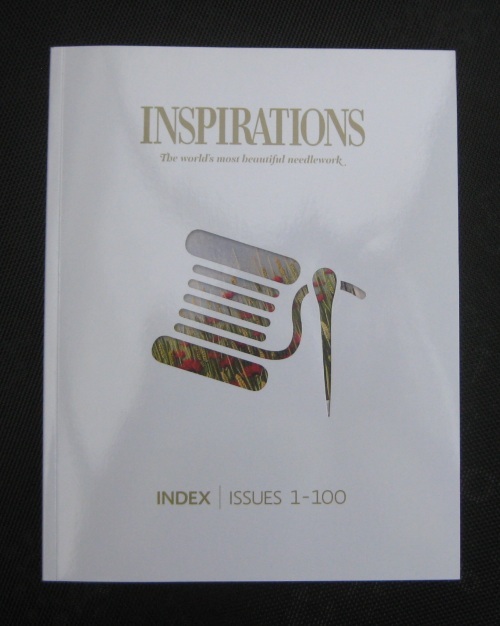 For those of you who collect the wonderful Australian embroidery magazine ‘Inspirations’ – either with a subscription, or just the occasional issue – this recent release from the publishers for an index for the first 100 issues will come as a welcome addition to your collection. 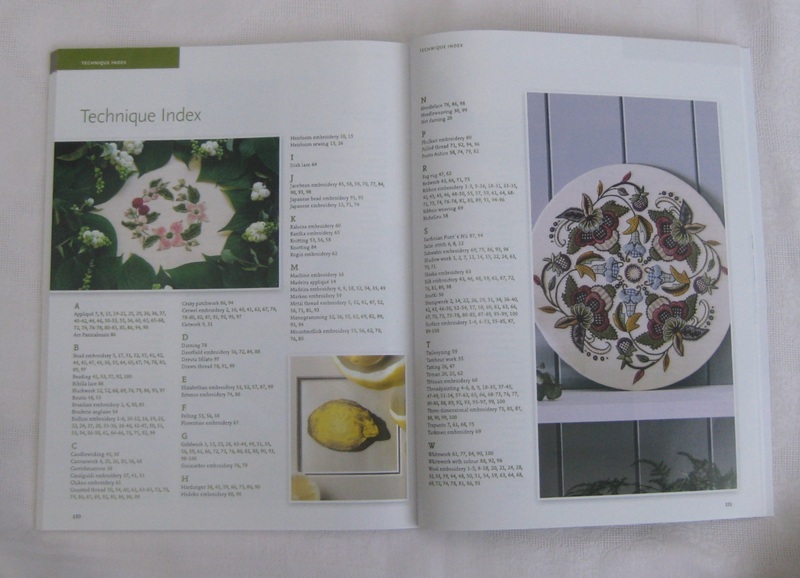 At first, I was a bit put out that the index costs almost £20 – as much as a ‘proper’ embroidery book! 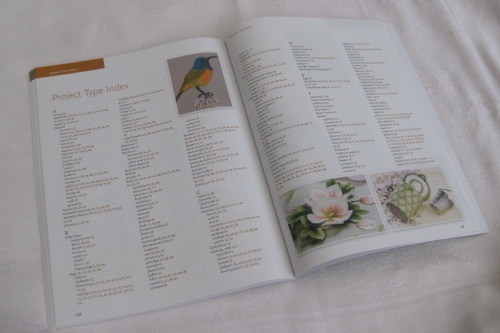 And this is ‘just’ an index….except it isn’t – it’s far more than that, really. It was pretty, in their usual style, but only had 16 pages, and was really just one list of projects and stitch diagrams, all listed together, with the occasional illustration to jazz it up. 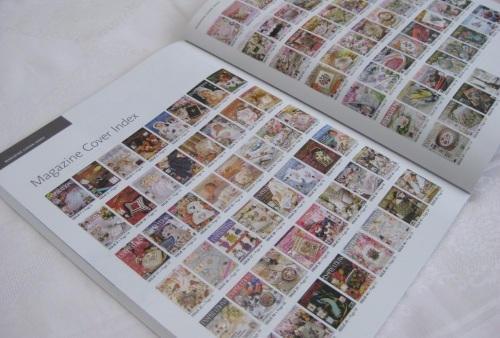 This new index for 100 issues is something else entirely! For one thing, it’s beautiful – really nicely produced, with lots of clear photos of all the projects, and magazine covers. 148 pages altogether! 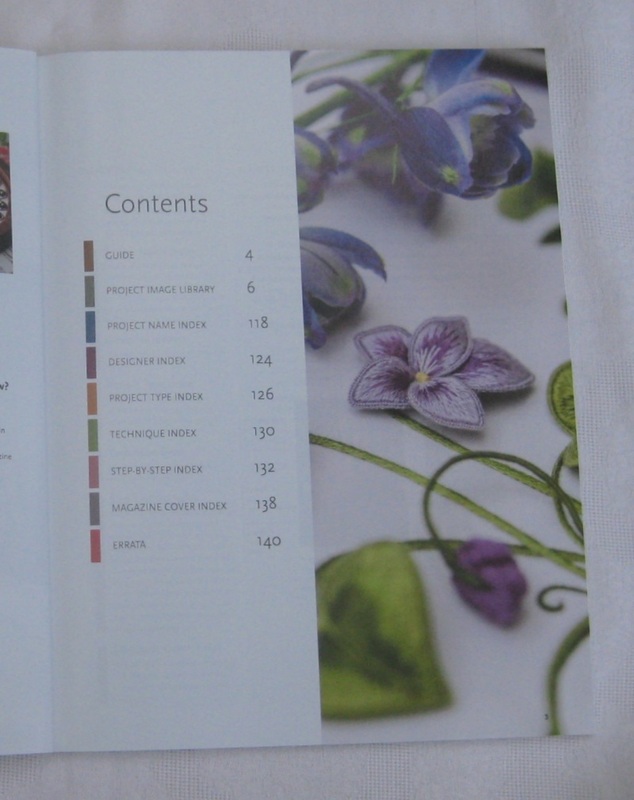 In the main part of the index, the cover for each issue is shown, as a visual reminder, and then all the projects for that issue are listed, with a quick note about what the main technique being used is, and which page it is on in the magazine. 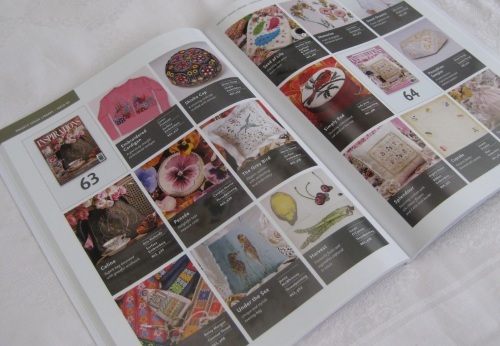 Just browsing through this main section made me realise how many lovely projects there are that I’d still like to stitch! There is a good section at the back, of projects by type (so, if you wanted to make something for babies, or a doorstop, for instance, you could track down a suitable project here). 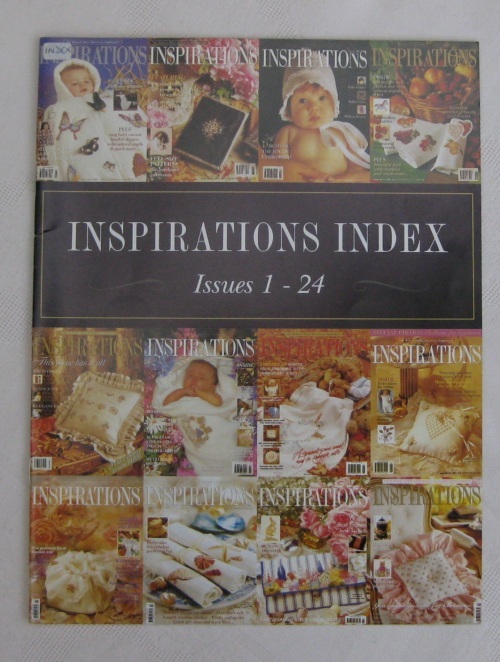 There’s also an index of designers, so if you want to see all the projects, for instance, that Carolyn Pearce has done for the magazine over the years, then see this section to look them up. 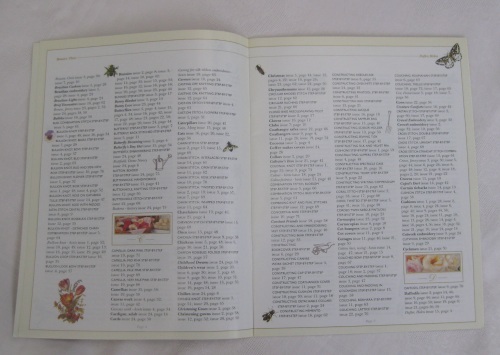 There’s also a technique index, and it’s amazing to see how many types of embroidery have been featured over the years. 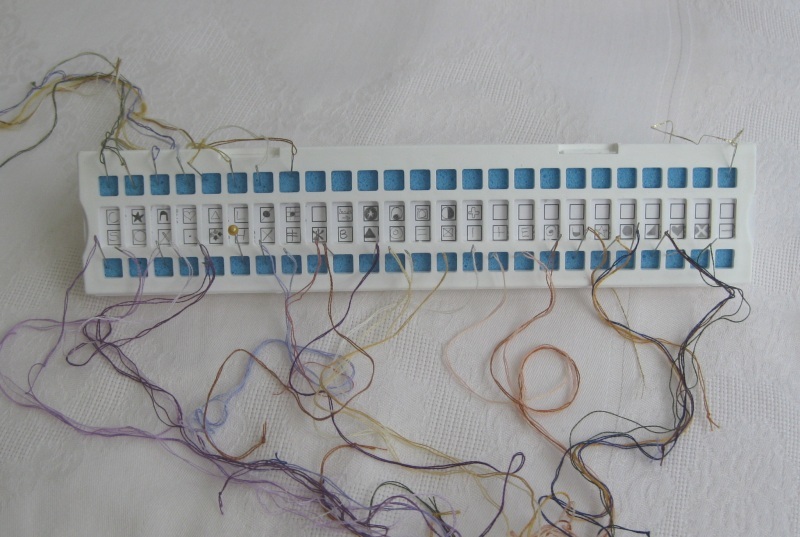 There’s even an index of the step-by-step how to’s for particular stitches, which is really useful. One section which is very useful is where they list the errata (there’s bound to be some in a magazine with this much detail!). This section includes reprints of charts, or parts of designs if necessary, or just a description if it’s a little thing that needs correcting. If you don’t own the full set of back issues, you might think that this index is of no use to you….however, although many of the back issues are now sold out – especially the early ones, which, when they pop up on Ebay occasionally, sell for a lot of money – many designs are available as digital downloads from the website now, so having the actual back issue is becoming less and less of a problem. Originally published in late 2018, this index sold out really quickly – it’s been reprinted, and is back in stock now (April 2019). Available from their website HERE. 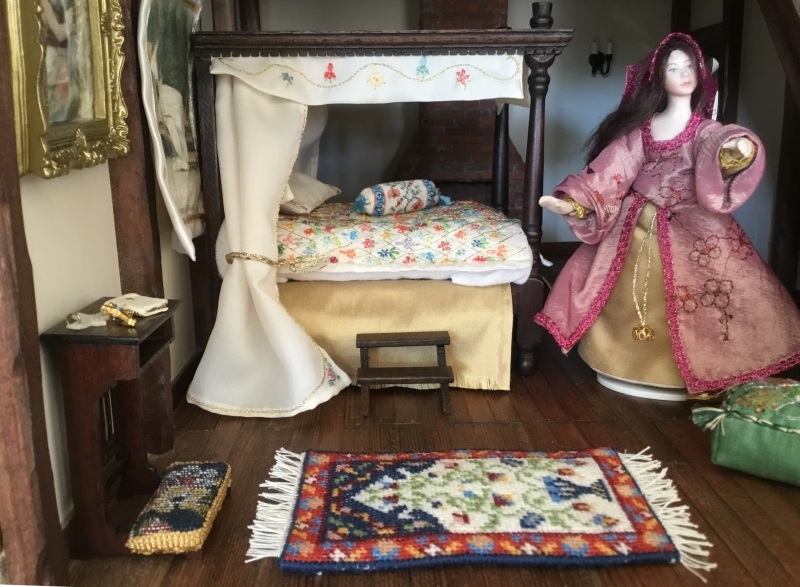 If you are into dollhouses, you’ll know that it isn’t always easy to find things suitable for a Tudor house. 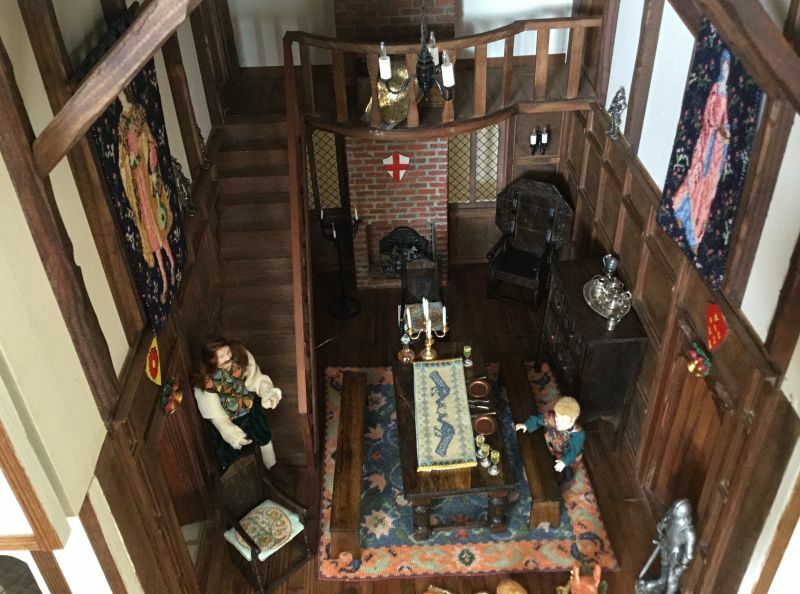 But this week, I had an email from a customer of mine, with images of her beautiful Tudor dollhouse stitching to look at – photographed in the most amazing 12th scale doll’s house. This customer (who’d prefer to be anonymous, so I’ll call her SB), has bought many of my kits over the years. She has several doll’s houses, but this Tudor one is her favourite, and the biggest! 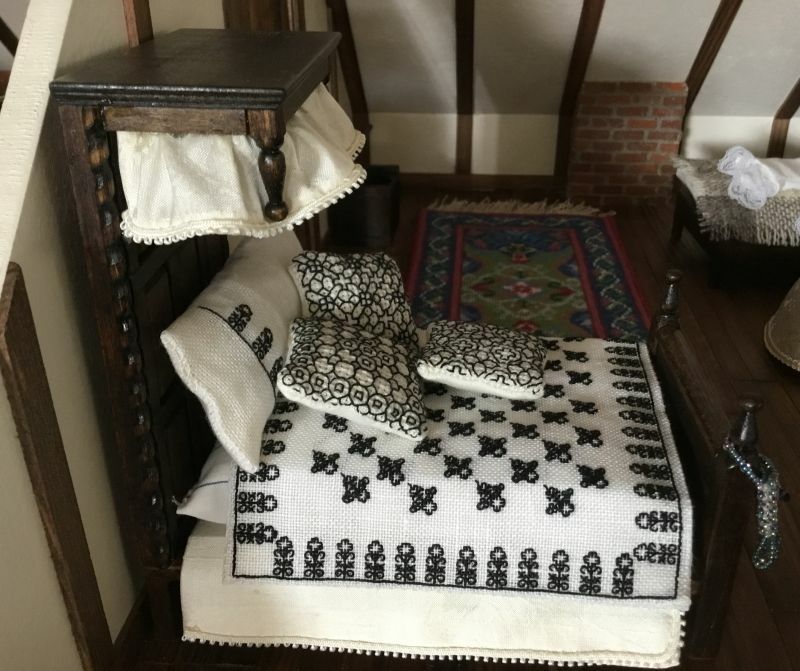 She explains the size of the house by saying that four poster beds are quite large, so she felt that the rooms needed to be large too, to accommodate them…and it just grew. She designed the house herself, and her husband had it made for her as a special birthday present. I think it’s a really interesting design, and looks just like a ‘real’ house. Here’s the master bedroom, with a four poster bed in it. SB made the doll in this room from a kit, but the clothes were made by her from scratch. She also made the floor cushion on the left of the picture from scratch. The rug on the floor is one of my kit designs, called ‘Natalia’. There’s also a bolster pillow on the bed, made from one of my kits called ‘Eleanor’. The instructions for this kit show you how to make the end tassels, that are only half an inch long! Here is the main hall. It’s a magnificent piece of miniature construction. I love the panelling! At each side of the hall are Cluny tapestries – the one on the left is the ‘Cluny Merchant’, and the one on the right is the ‘Cluny Maid’. The needlepoint kits for these have 22 count canvas in, and all the materials to complete the wallhangings, including the wooden poles. The carpet is called ‘Elizabeth’, and is stitched on 18 count canvas. The other stitching in this room is from a book that SB owns. In a detail of this room, you can see the very well-dressed man on the left hand side. This is another bedroom, with a half tester bed. SB stitched the blackwork covers and cushions for this bed to her own designs. 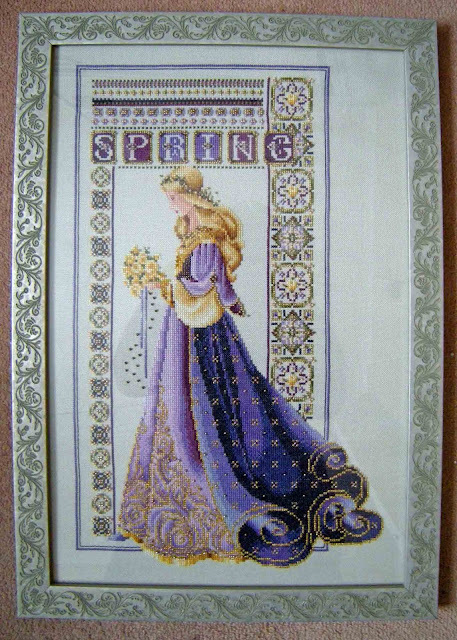 The rug in the background is one of my designs, but I no longer sell this one. It goes really well in this room, though. 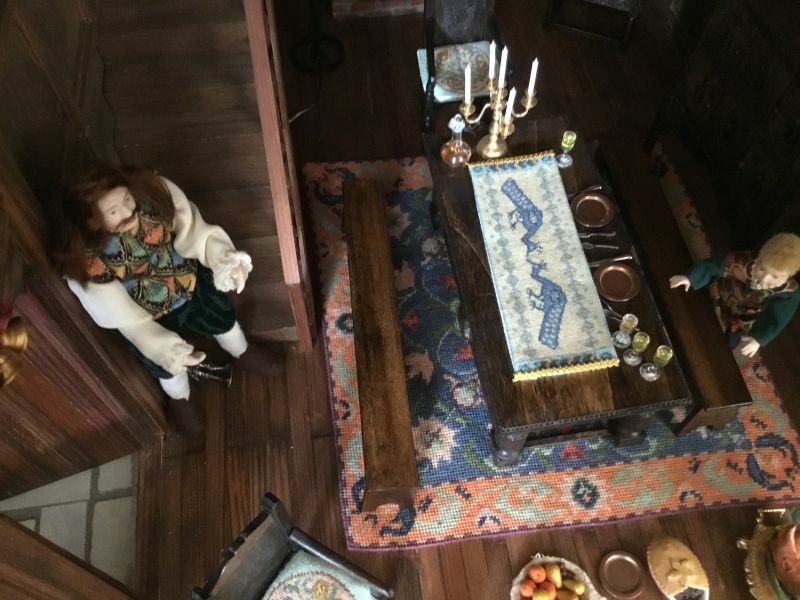 SB also sent me this picture of a room from another doll’s house that she has. 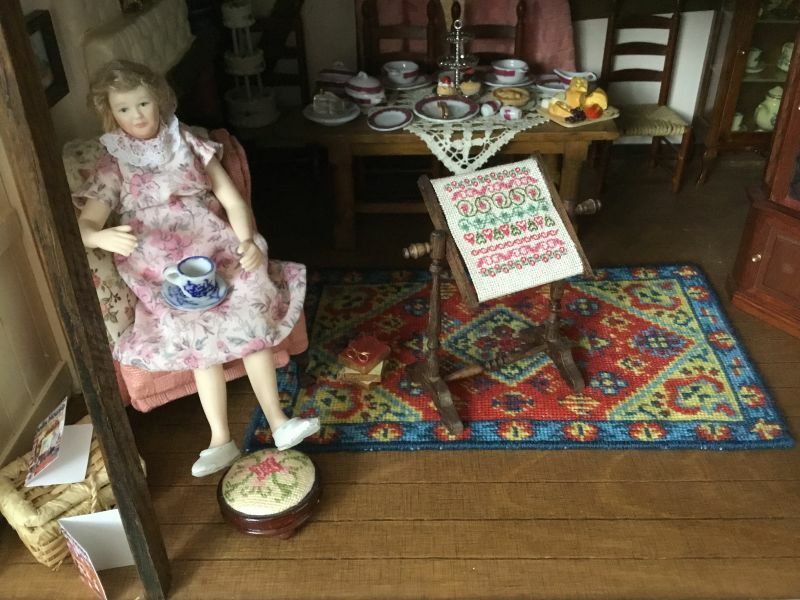 The doll in this room is having a well-earned cup of tea. The ‘Katrina’ carpet is in front of the table, which is set out with the tea things. The needlework stand, again, is a design of mine but I no longer sell this particular one. SB obviously loves her doll’s houses, and has spent many, many hours making them fantastically detailed. Although a doll’s house is never really finished (like a real house), these look almost there, to me! Isn’t it a lovely picture? Great frame, too. So, I got the chart, and the threads, all in one pack on Ebay. I even got the beads included, so all I had to do was sort out the fabric. 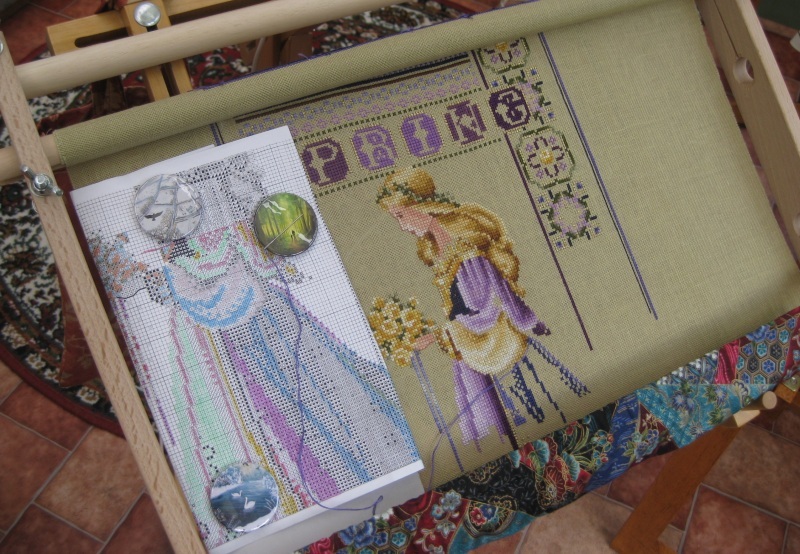 I’ve chosen 28 count Prairie Grain fabric to stitch it on – it’s a soft grassy green, which looks really good with the purples and yellows of the dress. I couldn’t find the Willow Green fabric recommended on the chart. This photo doesn’t do justice to the fabric – it’s a lot greener than this really! This is a picture of how much I got done in a week of evenings. The beads still need to be added, but it’s a pretty good start. The ‘Summer Roses’ design on a doll’s house scale dining chair. The chair measures just 3 1/2 inches high. This tiny the doll is only 1 3/4 inches high. Yup. Weeny! Janet Granger's Blog Blog at WordPress.com.